Jaded Blossom: Guest Designer, Heather! I am absolutely giddy to be a guest designer today for Jaded Blossom! Thank you Michelle and Candace for allowing me to be apart of Jaded Blossom's First Birthday Celebration! For my project today, I decided to make a Christmas ornament for my Mother's red & white Christmas tree (her birthday is tomorrow!). center focal point on both sides of the ornament. The base of this ornament is a smooth styrofoam ball. I folded 2.5" pieces of ribbon and "quilted" them around the Noel. Once the both sides of the "quilting" is done, I wrapped a folded and glued piece of the white ribbon around to hide the "seam". Topped off with some pretty ribbon, a ribbon to hang it with and it's all done! This is BEAUTIFUL!!!! 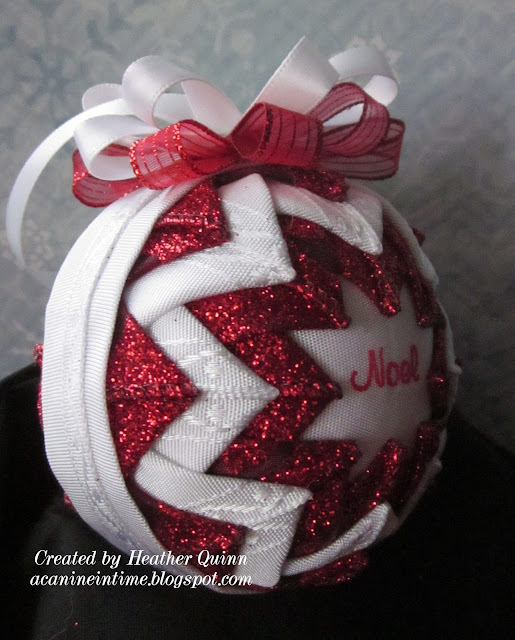 I love how you quilted the ornament!! I have never seen this look before!! Great job!! This is beautiful! I love seeing the stamps used on things other than paper! Thanks for sharing!! This is so pretty--I like your choice of ribbons. 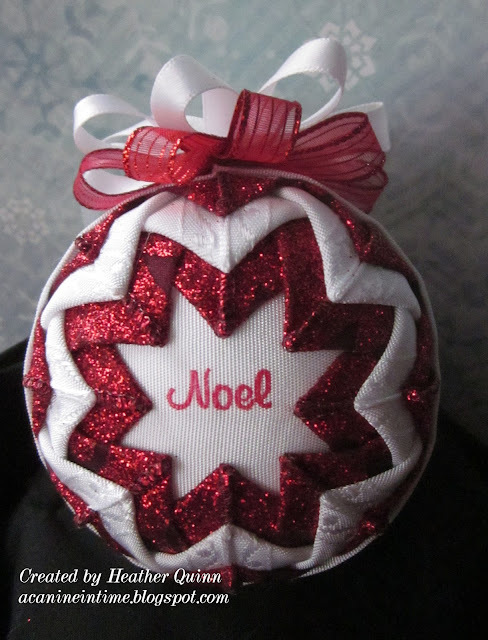 Beutiful sparkle embellishment on this ornament. Wow that's incredible! Very nice! Love how you embossed on it. Beautiful!!!!!! This is pretty. Love this idea. Great job. Very very pretty! Your mother will love it! WOW. This is so pretty. Amazing!! All you of so imaginative with these stamps!!!!! Love seeing out of the box thinking! SO BEAUTIFUL!!! I LOVE your ornament it is AMAZING! Your mom will love it! What a beautiful ornament and a gift your mother will love. Thanks for sharing it with us today. This is absolutely gorgeous! I love how you used the stamp!! I'm sure your mom will LOVE it!! Thats beautiful! And so creative! So beautiful. Will have to learn how to make these. OMG, this is stunning!! Thanks so much for sharing! I do believe your mom will love it!! TFS a great new idea! Wow! This is beautiful! I love the ornament and the quilting theme! What a great gift! Such a pretty ornament! I love the red and white. This is so pretty! I love the red and white. how pretty. I love every part of it. It's timeless. Thanks for sharing! What a beautiful ornament. Very cool that you embossed the sentiment.